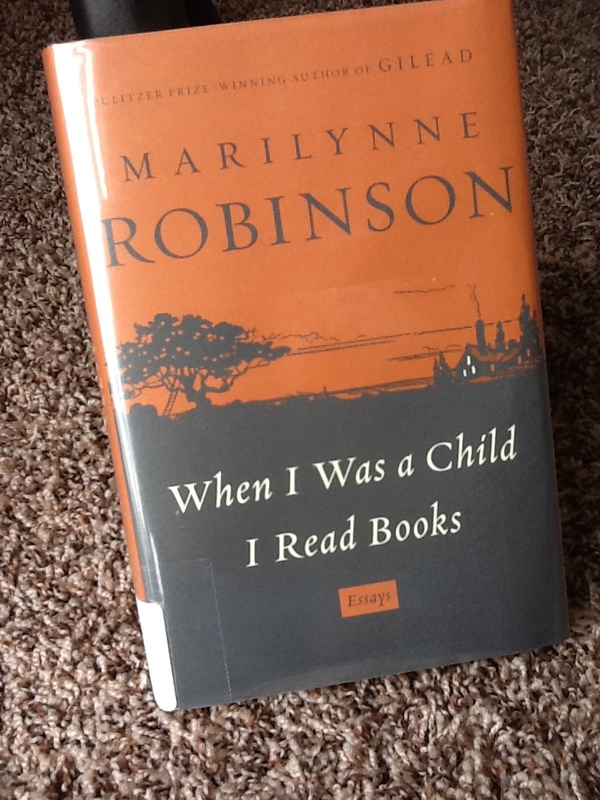 When I Grow Up I Want to Be Marilynne Robinson – The Bookshelf of Emily J.
Marilynne Robinson is so smart that I can barely understand her books. Her work forces me to slow down, savor each sentence, and really think about what I’ve just read. When I put forth this effort, I am richly rewarded by her prose. She’s like Joan Didion, another one of my favorite essayists, only Robinson is religious. Her newest book, When I was a Child I Read Books, is a collection of essays that grapple with the issues facing our nation. She is a religious woman who looks at societal problems through the lens of her testimony and experience. She is also a professor at the Iowa Writer’s Workshop, a program that produces most of our country’s up and coming literary stars. Her own literature, Gilead (2004) won the Pulitzer Prize in 2005. It is about a preacher who writes his autobiography at the end of his life for his son. He knows he only has a few months left to live because of a medical diagnosis. As he writes, he is able to overcome ill feelings he has had toward a young man in his congregation for years. He is healed of this affliction, making the title of the book Gilead, apt. As I read, I began to ponder the Balm of Gilead. The bible dictionary tells us it is “an aromatic gum or spice used for healing wounds.” The bush that produced the resin from which the balm was made grew abundantly in Gilead; therefore, it became known as the Balm of Gilead. This balm, a very real medicinal substance, is now used as a metaphor in our day for a substance that can heal our souls. In one of my favorite hymns, “Did You Think to Pray?” we sing: “When sore trials came upon you, Did you think to pray? When your soul was full of sorrow, Balm of Gilead did you borrow at the gates of day?” This song tells us that the Balm of Gilead is prayer. This has been true in my life. I began to pray earnestly for this girl. After several weeks, prayer changed my heart and I had a desire to be kind and friendly to her. She and I ended up both attending the same college so I continued to see her occasionally, but I stuck with praying for her, and my hateful feelings never returned. “Someone told me recently that a commentator of some sort had said, ‘The United States is in spiritual free-fall.’ When people make such remarks, such appalling judgments, they never include themselves, their friends, those with whom they agree. They have drawn, as they say, a bright line between an ‘us’ and a ‘them.’ Those on the other side of the line are assumed to be unworthy of respect or hearing, and are in fact to be regarded as a huge problem to the ‘us’ who presume to judge ‘them.’ This tedious pattern has repeated itself endlessly through human history and is, as I have said, the end of community and the beginning of tribalism” (30). See how smart she is? She uses her own religious principles as a way to argue against those who use religious principles to tear down or judge. I guess that’s why I’m so impressed with her. She seamlessly combines religion and education in a way that isn’t overtly annoying, judgmental, flashy, or defensive. She is herself. She is confident in her beliefs. And she’s also a critical thinker. She thinks about what she reads and she disputes it if necessary. This critical thinking is something I plan to take from her example. I realized as I read her book that when I read something in print, whether it be an essay on education or an article in The New York Times, I tend to believe every word of it. I swallow and accept it as truth. I assume that what other people are writing and saying must be right if it is in print or if it appears in a venerable publication. However, Robinson several times based her essays on others’ printed words, using them as a springboard to elucidate her own truth. She isn’t afraid to argue with other great minds. She isn’t easily sucked in by everything that is printed. And she shouldn’t be. She’s a great mind herself. I know that I must now filter what I read through my own lens of experience and beliefs. Robinson also takes on atheists in the most eloquent and educated manner that I’ve ever encountered. I am not an atheist, as is probably obvious from some of my other posts, but I have a few friends and acquaintances that are. I never know what to say when the subject of God is brought up. I don’t ever want to offend my friends or make them feel uncomfortable. And, I am honestly not that good at speaking extemporaneously. I’m that person who thinks of a really pertinent or witty remark days after the incident in which it would have been appropriate. “I would like to propose a solution of sorts, ancient and authoritative but for all that very sporadically attended to. What if we were to say that human beings are created in the image of God? It will certainly be objected that we have no secure definitions of major terms. How much do we know about God, after all? How are we to understand this word ‘created’? . . . But it is on just these grounds that this conception would rescue us from the problems that come with our tendency to create definitions of human nature that are small and closed. It would allow us to acknowledge the fact, manifest in our culture and history, that we are both terrible and very wonderful” (158-59). As a person who believes in God, I felt comforted to hear an academic person say this. She stands up for God in such an eloquent and rational way. I have felt myself shrink from claiming to be religious at times, especially when those portrayed on television as religious, particularly in the political arena, come across as so crazed and extreme. I am not radical and I am not a zealot, but I do believe in God, and it’s good to know that there are other moderate people out there like me who can be scholarly, articulate, and religious. Robinson proves that being religious doesn’t equal being crazy. Robinson, Marilynne. When I Was a Child I Read Books: Essays. New York: Farrar, Straus and Giroux, 2012. Pingback: On My Bookshelf, No. 12 | The Bookshelf of Emily J.